Lifefactory Silicone Teether 2 Pack - Pink/..
Lifefactory Silicone Teether 2 Pack - Sky/S..
Lifefactory Glass Food Storage 240ml - Oran..
Lifefactory Classic Flip Cap 22 oz - Carbon..
Lifefactory Classic Flip Cap 16 oz - Grass ..
Lifefactory Classic Straw Cap 16 oz - Sprin..
Lifefactory Silicone Teether 2 Pack - Yello..
Lifefactory Baby Bottle Flat Cap 9 oz - Gra..
Our baby bottles are made of the highest quality, thermal shock resistant borosilicate glass. 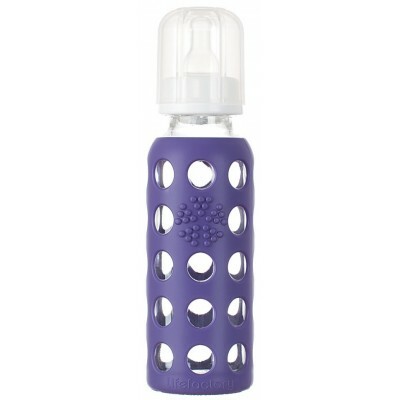 This allows our bottles to transition safely from freezer to boiling water. The silicone sleeves provide a good gripping surface for little hands and help protect against the occasional drop.